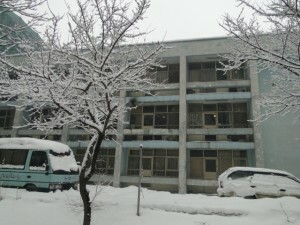 The library is a 1960s style building, modest but well-constructed. 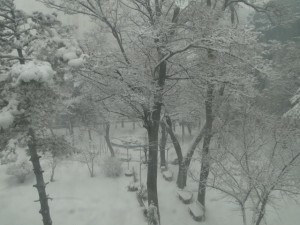 It was snowbound on this late February day and there were few readers present. 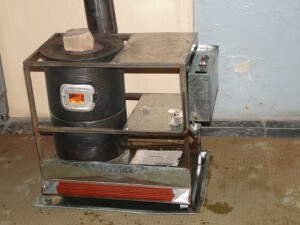 In the main reading room a charcoal-burning bukhari stove was being used to ward off the cold. But it was not the only bukhari in the library, and it was unsettling to think of so many smouldering stoves in the midst of so much flammable material. 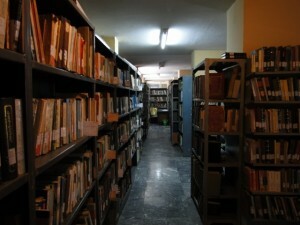 The library is said to have 220,000 books, of which 180,000 are in Farsi/Dari. Of the rest most are in English, French, German and Urdu. 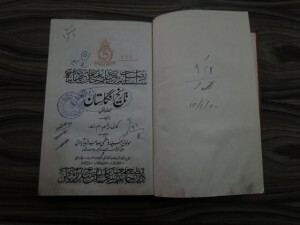 ‘Tarikh Inklistan’, a translation of a history of England, is one of the Urdu texts in the collection. 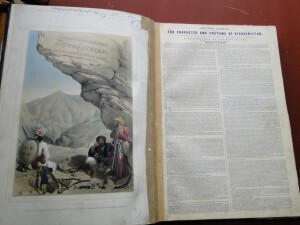 I was interested to see that it had been donated by Hyderabad’s Osmania University. 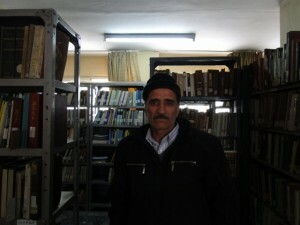 One of the librarians, Abd al Rahman has spent 35 years in the Library’s service. He worked there through the Taliban years. 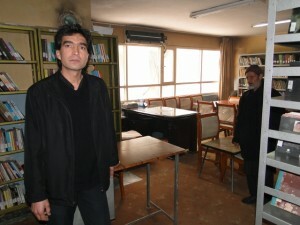 Although some books were burnt and destroyed the library stayed open through that time and he continued to receive his pay. There is a small but cheerful children’s section. It includes a displayof toys, complete with guitars and toy guns. 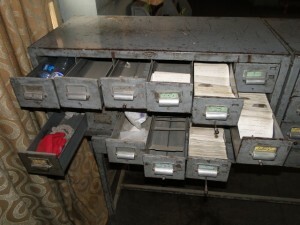 The card catalogue is in an unfortunate state. There are plastic bottles in a drawer. Mr Nisar Ahmed is in charge of this section. 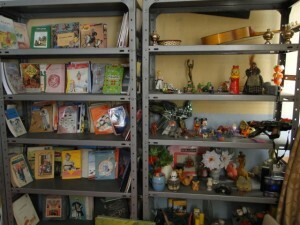 The collection is not large but it contains many 19th and early 20th century books in English and other languages. 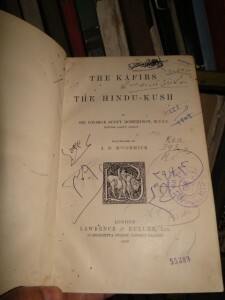 This one is called ‘The Kafirs of the Hindu Kush’, and is not in bad shape despite the scribbles on the title page. 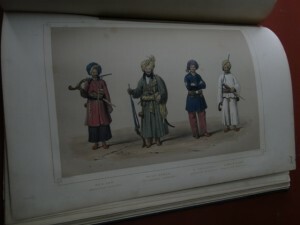 There are some fine collections of prints, including this one: ‘The Character and Costume of Afghaunistan’. 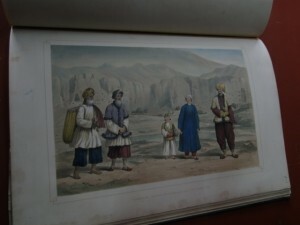 This print has the Bamiyan Buddhas in the background. This is an illustration of Afghan military costumes and equipment. 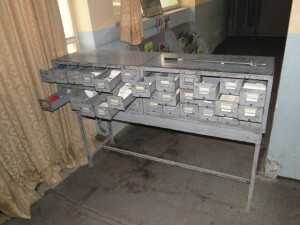 This is the newspaper reading room. 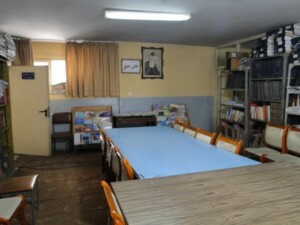 The picture on the far wall is of Jalal al-din Rumi (‘Mawlana’). and his staff do their best to cope under difficult circumstances. Even as we were speaking a reminder of this arrived in the form of a text message announcing a suicide bombing in Kandahar. 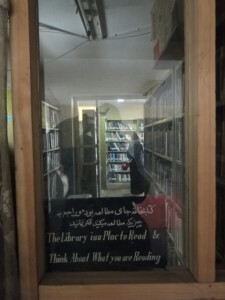 The building is badly run down but considering all that has happened in Afghanistan in the last thirty years, the library is in better shape than might be expected. 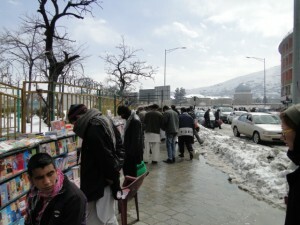 as is evident from the brisk business done by pavement booksellers in central Kabul. A thriving public library would serve a real need. It is surprising that nobody from the world community has stepped in to help. 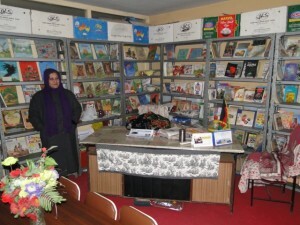 Surely there are thousands of libraries across the world that could enter into partnerships with the Kabul Public Library? Thanks so much! Always uplifting to see words and pictures of serenity from a place that often gets place on precious newsprint only when there’s gore or intrigue to report about. Is there anything an individual can do to help out? I would love to send books (though mine are all English) or a little bit of money. Thank you Mr. Ghosh, for this pictorial.. It gives me hope. What can public libraries do to help or enter into a partnership? I wish I could answer that. I really don’t know. Perhaps you could approach the US State Dept or UK Foreign Office. Also USAID and the Canadian Aid Depts might be able to suggest something. 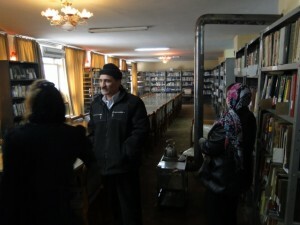 The Kabul Public Library…I know it well. 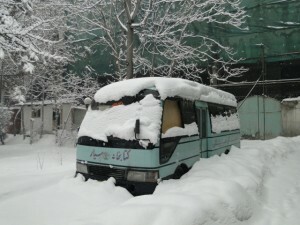 It stands a short distance across from the Hotel Kabul and down the street from the Melli Bank. In 2004, I presented the library with a CD of ‘Free Afghanistan’, the full text index of Af materials in Western languages that I produce…but, that’s another story. Following the ‘ceremonial’ presentation’s tea and Russian hard candies was a demonstration of the disc’s contents to the Director and his staff. As the demonstration proceeded on PC (donated by the Islamic Republic of Iran), someone asked if the Director was mentioned. 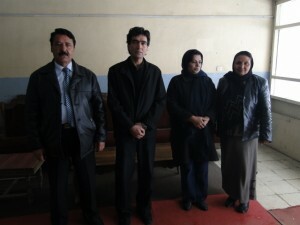 Transliterating his name and creating a search yielded his affiliation with the Parcham branch of the PDPA (People’s Democratic Party of Afghanistan or Afghan Communist Party). Immediately the demonstration was terminated, the staff dispatched and I was profusely thanked for the CD. But as I walked down the hall from the ‘Director’s office I heard the distinct SNAP of a CD being broken. 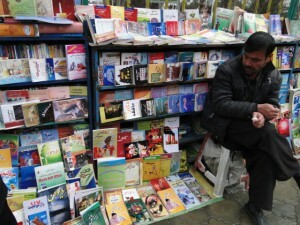 Ah, yes, the Kabul Public Library….